The "Scapegoat" Doctrine of Leviticus 16:10 taught here. Also, the coming of the Modern Day "Servant", "Elijah" the prophet and the "Spirit of Truth" are explained here. (Isaiah 49:1-7; Malachi 4:5, 6; Matthew 17:10, 11; John 16:13-15) As well as the Great "Mystery of God" as revealed, in the first prophecy from God of Genesis 3:15. Location: Founder YORWW Bible Institute & Training Center resides YORWW World Headquarters Jamaica, W.I. ... what would your answer be? Would your answer be ... the Ark could possibly represent or picture Jesus Christ, the "Messiah." Or would you say, it represents namely, "Jehovah’s Holy "Presence" with the nation of Israel? Many, including Jehovah's Witnesses would respond that way, of course. Or, do you believe it could possibly represent Almighty God's Universal Power & His Visible Rulership over mankind, through the nation of Israel? To be sure, these are all excellent answers to such a question, we [YORWW] would readily agree. However, at the end of this article, we will ask this very same question of you again, to see if your answer changes any. A CLOSER LOOK AT THE "ARK OF THE COVENANT"
First it must be acknowledged, these are all very interesting responses to such a question. However, we at the YORWW Congregation actually would respond to this particular question in a very different manner. We would say, the "Ark of the Covenant" actually pictures something very different, something very unique in God's Hidden Purposes, ever since mankind's creation. (See Genesis 3:15.) Yes, we would say the "Ark" becomes a very special "paradigm" of sorts, for the fulfillment of a 6,000-year Great "Mystery" [Greek: mysterion] or "Sacred Secret" of God, as revealed through the book of Revelation, as well as all of the other prophetic books of the bible. -- See Revelation 10:7; Revelation 11:19; Revelation 22:6. In the past we know, the "Ark of the Covenant" was closely associated with Jehovah God’s Unique "Presence" & "Blessings," all throughout history, with the nation of Israel. But that does fact itself, necessarily mean that the "Ark of the Covenant" itself, can be said to actually represent Jehovah's Holy Presence, per say. Well, let's take a closer look. On the Day of Atonement (yohm hak·kip·pu·rim´, meaning “day of the coverings or propitiations” [Le 23:27, 28]), the high priest entered the Most Holy and spattered some of the bull’s blood before the cover (at its front, or east side) and then did the same with the blood of the goat. (Le 16:14, 15) Thus the gold cover of the Ark played a special role in the typical propitiation (covering) of sins. Indeed highlighting its great importance, we remember the "ark of the covenant" was the VERY FIRST PIECE OF FURNITURE that God directed Moses to make for the Tabernacle of worship for the Israelites in the wilderness. Also, it appears the "Ark of the Covenant" was the only piece of furniture that was retained for actual use in Solomon's Magnificent Temple, from the original Tabernacle used by Israel. To be sure, the removal of the "Ark of the Covenant" from the nation of Israel has proved to be a great mystery over the years. No one knows exactly what happened to it. Curiously, neither did Jehovah give instructions as to making another "Ark of the Covenant" either for the nation after its disappearance from Israel. Nevertheless, its great significance and importance in worship for the nation of Israel can be attested to even by our consideration of the book of Revelation. The book of Revelation again mentions the "Ark" being found, once again. In Revelation 11:19, the "Ark" is shown as being one day, finally found by the spiritual nation of Israel. It is seen again, in the last days, by God's nation of people to be "in the Temple of God," just where it is supposed to be. So the mystery of the "Ark" is one day finally solved for us. THE HIDDEN SIGNIFICANCE OF THE "DAY OF ATONEMENT"
Now, going back, let's enlarge on the hidden significance of the “Day of Atonement” and some of its features, to help us understand more about the mysterious "Ark of the Covenant" and what it means for us today. -- See Leviticus 16th chapter. "And my servant David will be king over them, and one shepherd is what they will all come to have; and in my judicial decisions they will walk, and my statutes they will keep, and they will certainly carry them out. And they will actually dwell upon the land that I gave to my servant, to Jacob, in which your forefathers dwelt, and they will actually dwell upon it, they and their sons and their sons sons to time indefinte, and David my servant will be their chieftain to time indefinite." "For there has been a child born to us, there has been a son given to us; and the princely rule [government KJV] will come to be upon his shoulder. And his name will be called Wonderful Counselor, Mighty God, Eternal Father, Prince of Peace. To the abundance of the princely rule and to peace there will be no end, upon the throne of David and upon his kingdom in order to establish it firmly and to sustain it by means of justice and by means of righteousness, from now on and to time indefinite. The very zeal of Jehovah of armies will do this." We begin to notice something important from comparing the promises of the old Mosaic Law Covenant and the newer Christian Law Covenant, given by Jesus. Whereas the emphasis in the Mosaic Law was upon a eternal earthly rulership and government, complete with Chief Ruler and King. Whereas, the Christian Law pictures or foreshadows things having to do with a “heavenly rulership” with Jesus as King in the heavens. (Matthew 28:18) There can be no question, but the Greek scriptures clearly places its emphasis upon a heavenly rulership up above, in the presence of God. Revelation 15:3 gives us a clue as to how we can better understand why this is so. It speaks of the ‘song of Moses’ as being "sung" or explained to others, during our time of the end. This "song of Moses" does connects back to the promise made in Exodus 19:5, 6, about a future earthly government for God. This thus becomes God's original promise to Moses of what He ultimately wanted Israel to become for him. "And they are singing the song of Moses the slave of God and the song of the Lamb, saying: “Great and wonderful are your works, Jehovah God, the Almighty. Righteous and true are your ways, King of eternity." And so we can see a connection that shows, even in our day, many things about what Moses taught, as in his law covenant, must come back to us again, in the last days. To further this point, Malachi 4:4 points out when this promised ‘Elijah’ comes, we will again have to remember the “Law of Moses” for our benefit. Now as previously stated, we remember the fact that some of the blood from the sacrifice of the first goat of Leviticus 16, was actually placed on the Ark of the Covenant itself. Now if we think of this in terms of Jesus’ sacrifice of blood, it would have to be his blood that was picture to have been placed on the "Ark of the Covenant," wouldn't you agree? On the Day of Atonement, two goats were used. One was sacrificed as a sin offering for the 12 non-Levite tribes, and the other was designated for “Azazel” and was sent away into the wilderness. (Le 16:1-27; see ATONEMENT DAY) Of course, those goats that were offered in sacrifice could not actually take away sins, but they merely pictured the real sin-atoning sacrifice of Jesus Christ. — Heb 9:11-14; 10:3, 4. So as many currently understand things, the blood of the first goat [which pictured Jesus' blood] was taken behind the inner most part of the temple, behind the curtain and applied to the Ark of the Covenant. What could this mean? Well, if we think about this, we realize that Jehovah was doing this to picture something very important. Yes, couldn't we say the "Ark of the Covenant" itself was being "atoned for," as the most holiest piece of furniture in the Temple? Isn't that so? So then, we come to realize, the Ark itself, yes, had to be “cleansed” before Jehovah. That is why blood itself was used, to cleanse of it of sin or wipe it clean, as a most holy instrument of God. So based upon this special viewpoint, isn't it true the Ark would have to picture something NOT PERFECT or NOT SIN-FREE in God's eyes? And again, it certainly could not picture Jesus himself, since as many believe, it was his blood itself that was used for actual "atonement," in this particular case. (John 7:38-39) 38 He that puts faith in me, just as the Scripture has said, ‘Out from his inmost part streams of living water will flow.’” 39 However, he said this concerning the spirit which those who put faith in him were about to receive; for as yet there was no spirit, because Jesus had not yet been glorified. These "living, healing waters," are again spoken of in Ezekiel 47th chapter, where they bring refreshing, healing spiritual restoration to mankind, by way of miraculous "trees" that "spring up" during such a time. -- Ezekiel 47:1-12; Isaiah 41:18-20; Isaiah 43:19-21; Isaiah 44th chapter. (Zechariah 14:8) 8 And it must occur in that day [that] living waters will go forth from Jerusalem, half of them to the eastern sea and half of them to the western sea. In summer and in winter it will occur. So now we would like to ask you again the same question we asked above ... namely, “what does the Ark of the Covenant represent or mean to you, now?" Indeed, we hope after reading this article that you have a much better understanding of the Grand Promises that Jehovah has in store for His Name People today. (Number 6:27; Acts 15:14) And how He intends to see those promises through, yes, using the modern day "Ark of the Covenant," or Scapegoat Arrangement of Leviticus 16th chapter. 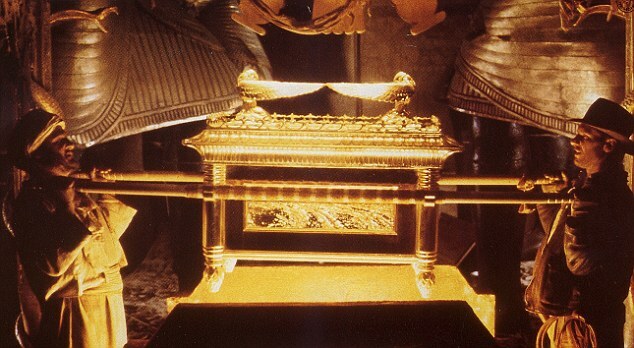 Re: What Does The "Ark of the Covenant" Represent To You??? Will This Be The First Time The World Sees The Ark of Covenant? Since then it's been the goal of many adventurers and archaeologists to find it. Most-famously, but also fictitiously, Indiana Jones was shown in the 1981 Steven Spielberg film the Temple of Doom carrying the Ark. 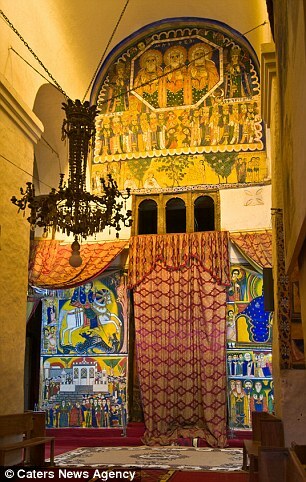 There has also been a long-running claim from the Orthodox Christians of Ethiopia that they have had the Ark for centuries, and since the 1960s it has apparently been kept in the chapel. 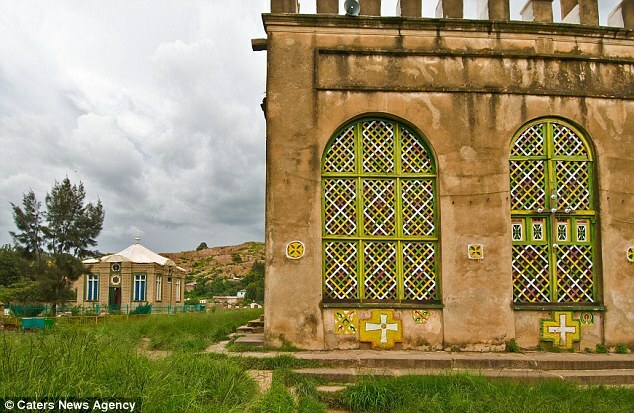 This small and curiously-styled building is surrounded by spiked iron railings, and situated between two churches, the old and new, of St Mary of Zion in central Aksum. No one has been allowed to see the holy object, described in scripture as being made from acacia wood, plated with gold and topped with two golden angels, except one solitary elderly monk, who must watch over the Ark for the remainder of his life, and is never allowed to leave the chapel grounds. But now the chapel - which was designed by the Ethiopian leader Emperor Hailie Selassie - has had to be covered in a tarpaulin to stop rain getting in. The water damage could mean the Ark will be moved for the first time in decades giving religious worshippers and adventurers alike a chance to see it. British photographer Tim Makins, 54, who is a travel photographer for publications like Lonely Planet, discovered the church had sprung a leak whilst travelling through Ethiopia last September. He believes the moving of the Ark could be one of the best ways to discover if there's any truth in the claims of the East African state. 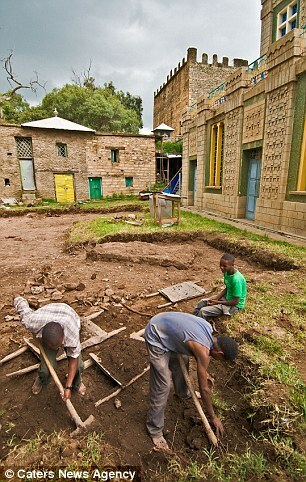 Tim said: 'During my most recent visit to the church, I was surprised to see some ground adjacent to the ''Chapel of the Tablet'' being cleared and levelled by workmen, and some quantities of building stone being assembled nearby. 'Asking around, I managed to discover that a new temporary chapel is due to be built, and the Ark is to be moved into it while the original chapel is repaired. 'It seems that the builders of the 1960s were not as careful as the builders of centuries past, and the roof of the chapel has developed some serious leaks that now need comprehensive repair work. 'To protect the Ark, a tarpaulin now covers the roof of the chapel but this is just a temporary measure. Tim said the construction of the new temporary chapel would take about three months according to workers and religious figures at the site, though he suspects that it will probably take much longer. 'That this can be done by the one person allowed to see it is unlikely, as The Bible describes the size of the Ark as 2.5 cubits in length, 1.5 in breadth, and 1.5 in height. 'Cubits in today's measurements translate to about 1.31 metres x 0.79m x 0.79m and it is normally carried on two long wooden poles.